Much of what appears in mathematics textbooks is what I like to call, downstream thinking. Downstream thinking usually involves two features that set the stage for learners. First, it provides a context (however doctored or engineered–often referred to as “pseudo-context”). Second, the problem provides a pre-packaged algebraic model that is assumed to have arisen from that context. Instructional time. Developing these models is messy and takes time, especially with class sizes in the mid-to-high 30s. Accessibility. Developing these models isn’t always possible (i.e. can’t run trials and collect data on every context). Scaffolding. Glancing through the assignment pages of our textbook, it follows this trajectory: explicitly give model and describe it, give context but ignore it, allow for students to build a sterilized version1. The textbook is trying to walk students (hand-in-hand) toward abstraction. One might assume that the provision of a context would mean that operating within it would prove useful for the resolution of the task, but students quickly learn that the context is only important for as long as it takes to read it. After that, the pre-packaged model is all that matters. This phenomenon is worsened by the lack of student involvement in building the model. These sorts of activities do all the important modelling work upstream, leaving only the completed model downstream for students to interact with. In doing so, we are missing the important work where students interact and experiment with the intricacies of the model. What’s further, I do not think that all important modelling work needs to take place in a context. What’s important in the direction of the work: that it asks students to build a model to specifications before turning around and employing the model to solve for unknowns. This is a theme I tackled at a session at NorthWest Math Conference hosted by the BCAMT. 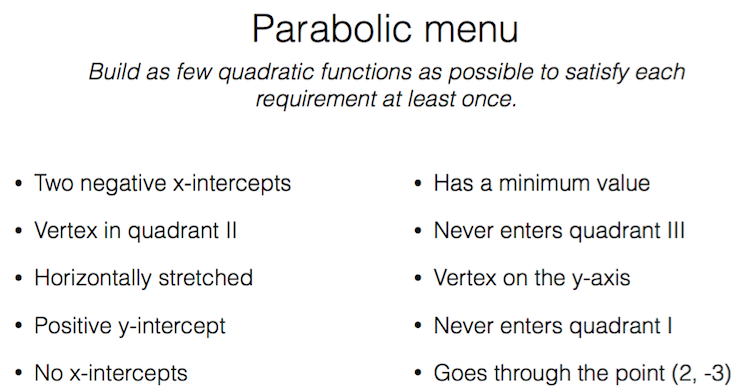 However, we ran out of time at the session before we could really sink our teeth into one of my favourite activities: the Quadratics Menu. The idea is a mash-up of two ideas that I had rattling around in my brain. The first is an assessment structure called a “menu.” Essentially, the assessment is made up of a series of questions (exactly like a traditional quiz), and each is assigned a value. The one my colleague showed me had questions ranging from 1-point to 3-points. 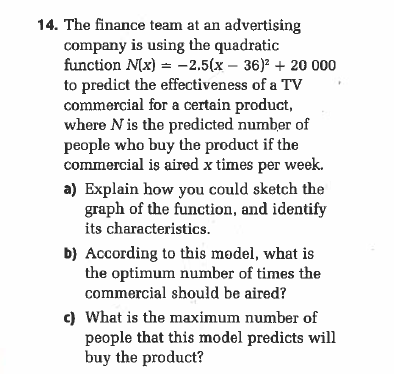 The student is required to complete “10 points” of questions. By infusing this extra layer of choice, the assessment increases metacognitive demand on the student. They now must think about the topics they know well, questions they are most comfortable with, and where they are going to get the most bang for their buck–so to speak. The second idea was one I’ve written about previously on this blog: Building custom parabolas. I love this activity, and it has become a staple in my classroom. The activity asks students to think upstream by building models to specifications. Notice, they do this without a whiff of context. That is, the models satisfy the constraints, but do not claim to map to some experience a student might encounter in their daily life. Not all context is bad (and mathematical modelling is important work). As mentioned previously, I am interested in the direction of the thinking: from specifications to model. So these two ideas combine to form a new activity. The goal is no longer to design 10 different quadratics to fit 10 different sets of specifications, but to add a layer of decision making by asking students to satisfy 10 specifications (in whatever combinations they desire) by using as few functions as possible. Build a parabola that has two x-intercepts and an axis of symmetry of x=1. The menu requires students to think upstream. Not only are they building models from specifications, they are asked to add a layer of decision making to the process by choosing which constraints to combine into specific functions. 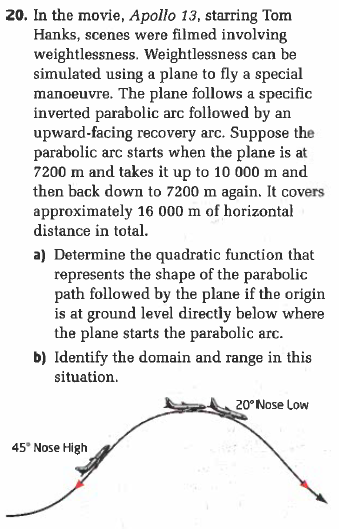 Is it possible to solve in 2, 3, or 4 parabolas? If you choose to work on the task yourself, I am directing the same three questions your way. An example of a sterilized context where students build model based on strict constraints (i.e. altitudes, distances) that are designed to find ordered pairs. The context still feels tangential, and the models are always interested in a small subset of characteristics (namely, those that allow for a precise and single solution).